Enrollment is now open for the 2019 – 2020 school year. Keys Montessori School Is Celebrating Over 40 Years! Keys Montessori School of Indiana, Pennsylvania is a private, academic school licensed by the Pennsylvania Department of Education. Keys Montessori School is a child-centered preschool and Kindergarten environment guided by the teachings of Dr. Maria Montessori, her methods, and philosophy of education. Within this structured, success-oriented environment, the child has the freedom to choose his work at his pace. The Montessori materials used at our school incorporate all of the child’s senses. The environment promotes peace as well as respect for the teacher, the materials, the classroom, and each other. Two classroom communities include both genders with multi-aged children (three to six years old, including Kindergarten). Children who attend Keys Montessori School are from varied cultural, religious, educational, and economic backgrounds and have varied levels of development and abilities. Keys Montessori School encourages parents to enroll their children in our program at their child’s third year and no later than their fourth year and then to remain with our school through their Kindergarten year. The younger children watch and learn from the older children, and the older children take pride in helping the younger children. 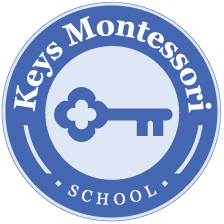 Keys Montessori School was established in Indiana September 1977 and has continued to provide a high-quality Montessori education for over forty years. The Montessori method of education at Keys Montessori School guides the whole child and meets the child where he or she is at on all levels of development: socially, physically, emotionally, and intellectually. Our multi-aged classroom eliminates competition and naturally allows the children to learn from each other. The Montessori materials we use incorporate all of the child’s senses. Our teachers observe and guide the children to help them grow and learn to their fullest potential. The benefits of being in the Keys Montessori School program for three to four years is this: using Montessori materials at an age-appropriate time allows the child to gradually build an understanding of the principles the materials represent. With these keys to knowledge, the child can explore, grow, and learn at his or her pace. Learn more about the Montessori method of education at the American Montessori Society website.